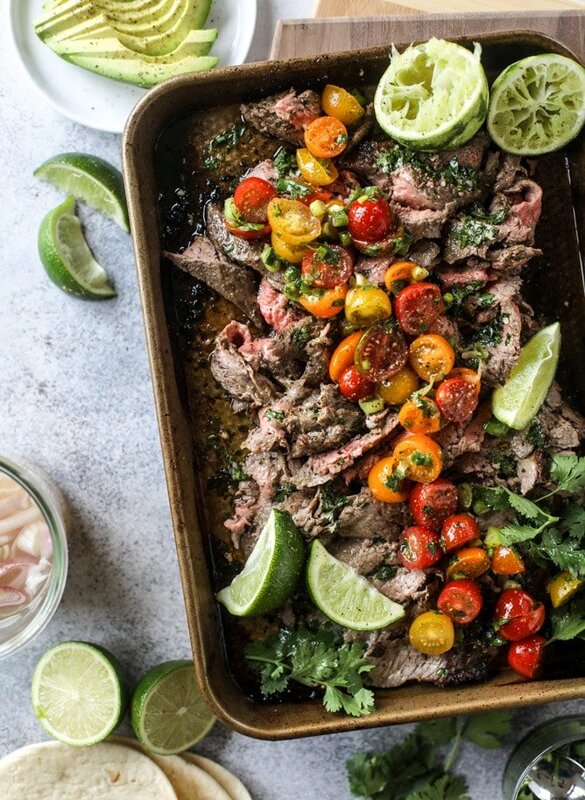 This cilantro lime flank steak is the way to my heart right now. I mean, it is GOOD. We are talking hearty and satisfying and delicious and flavorful and all the good things that you need in your life. Flank steak is super easy and perfect for so many different meals… therefore you need it. NEED. Like right now! And right in time for Memorial Day too. Eeeep! It’s the unofficial start of summer and I am so freaking excited. Like, I probably haven’t been this excited since I was in school myself as a tween? And back in those days, I sat on a towel in the front yard with a boom box blasting and a stack of Sweet Valley High books at my disposal. Elizabeth Wakefield was my pretend best friend even though I REALLY wished I could be as cool as Jessica. My head was permanently buried in a book though – and I wrote a ton of stories myself – so I was much more of an Elizabeth. Those days I didn’t have to even think about dinner because my mom had it on the table every night. But we grilled a ton. Chicken, steak, salmon, burgers – everything. The minute it starts getting warm, I’m inspired to fire up the grill. But in my secret brain? I’m convinced I’m going to burn down the house the minute I do. And I knooow that I make flank steak all the time. It’s totally a nostalgia thing because it’s what we always ate growing up, but I also love it so much. And it’s easy! There’s a recipe for flank steak tacos in The Pretty Dish too, so I just can’t stop. But last week, on Mother’s Day, I made the MOST delicious meal. Before you’re all “but whyyyy were you cooking on Mother’s Day” it’s because I have a mom and I cooked for her and nothing else is more awful than going out to eat on Mother’s Day. Worrrrrssst ever. So! I made flank steak and crispy roasted potatoes and asparagus and salad and it was so, so good. We repurposed the flank steak the next day into tacos (of course) and then Eddie had it one more time as leftovers for lunch, and he hasn’t been able to stop talking about how delish it was. I couldn’t not share this because we adore it. And it’s super versatile. Tacos, salads, nachos, whatever you’re feeling. Plus, I want to drink the marinade. Lots of cilantro and lime. Apologies to you cilantro-tastes-like-soap people! Swap it out for another herb and you’re good to go. This is a slightly easier version that these flank steak fajitas I shared a few years ago, but it’s the same idea. There are SO many different options. A bunch of ways to stretch or repurpose leftovers. Okay and! I also really love this hot or cold. We always serve it warm for dinner, of course, but grabbing it out of the fridge for lunch? No big deal because it’s so good. Also complements a margarita REALLY well, thank you very much. I like to take the flank steak and use a meat tenderizer on it - pound it out a few times all over. Place the flank steak in a baking dish or a ziplock bag. In a bowl, whisk together the cilantro, olive oil, lime juice, lime zest, garlic, red pepper flakes, salt and pepper. Pour it over the flank steak and marinate anywhere from 30 minutes to 2 hour or even overnight! When you’re ready to cook the steak, you can grill, broil or pan sear it to your liking. I tend to broil it as I find that easiest. Preheat the broiler in your oven and move the oven rack as close as possible. Place the steak on a broiler pan or baking sheet and broil on each side for about 5 minutes. This usually results in a medium doneness in my oven - but since the edges are thinner, they tend to be more well done. Allow the steak to rest for 10 minutes before slicing it thinly against the grain. While the steak is resting, toss together the cherry tomatoes, onions and cilantro with a pinch of salt and pepper. Juice half the lime over top and toss well. 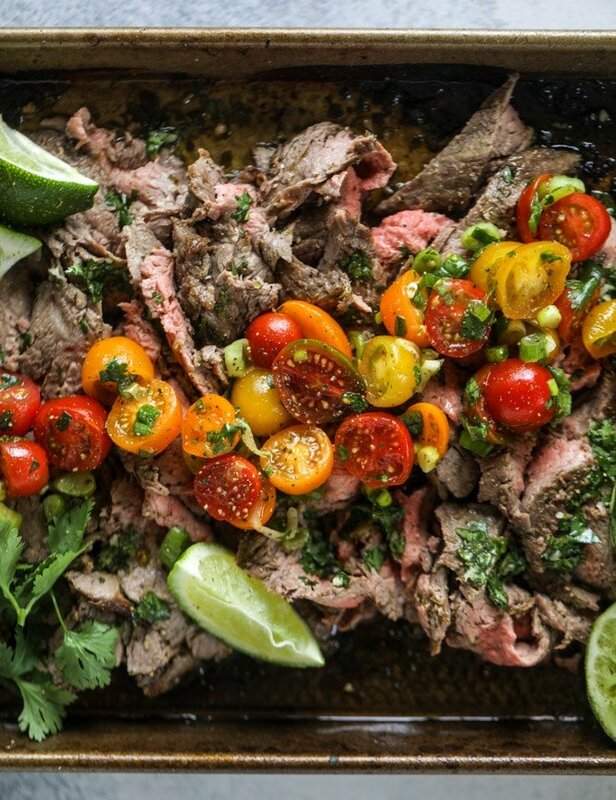 Place the tomatoes on top of the sliced flank steak and serve. We love to do this as tacos, on salads, or as a main dish with rice, quinoa or potatoes, along with a green veggie like asparagus or broccoli! About to wrap this up in a tortilla blanket and devour it. For some reason, cooking steak always intimidates me but this looks so good and now I can’t get steak tacos/nachos out of my head. Going to give it a try! This looks amazing! Would you consider posting a video tutorial on cutting the steak? I’m very visual and last time I basically just chopped the thick cuts into fajita-sized strips…I think I missed the whole “against the grain” thing. i can def do that on insta stories!! oh but also, if it helps, i almost “shave” it off with a super sharp knife! against the grain. For a more medium rare…. 3-4 minutes each side? Looks amazing. Growing up my Mom had a Flank marinade recipe that was SOOOOOOOOOOO good! It was a ‘birthday request’ kind of meal! Can’t wait to try this one. I am so with you! Going out to eat on ANY holiday is trash. Valentine’s Day out is best celebrated in our house and then out to dinner two weekends in either direction of the actual 14th. Amazing and lovely to prepare for guest. Just made this cilantro & Lime flank steak receipe. BBQ’d the steak 4-5 minutes per side. It was very tender and delicious! Will make it again! Loved this recipe! I had had a flank steak sitting in the freezer for awhile, googled recipes, and I’m glad I tried this. I marinated it a few hours, the meat was tender and delicious. The tomatoes were the perfect touch to top it off. It looks like it calls for a 12 pound flank steak.